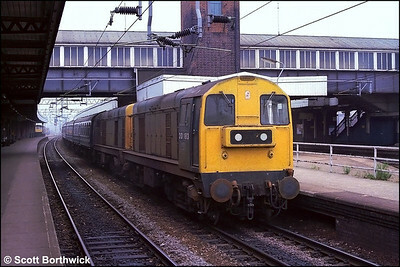 20113+20075 stand at a damp and cold Skegness after arriving with 1E86 0838 Leicester-Skegness on 17/09/1983. 20183+20075 await departure time at Nuneaton with 1E86 0742 Nuneaton-Skegness on a dreary 21/07/1984. 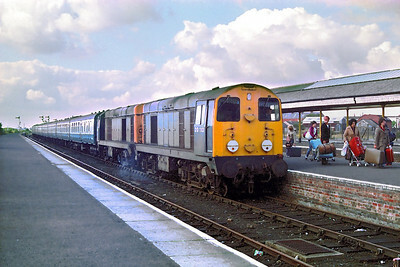 The train was the 0816 ex Leicester which for this and the following Saturday (28th) started back at Nuneaton. 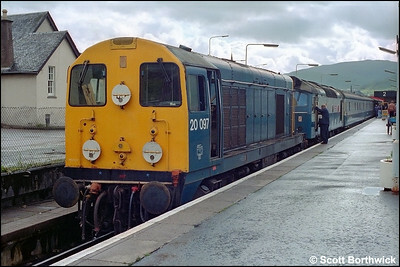 20097 prepares to shunt 97252 ETHEL3 and the Fort William-London Euston sleeping cars onto the 1550 Mallaig-Glasgow Queen Street at Fort William on 19/07/1985. 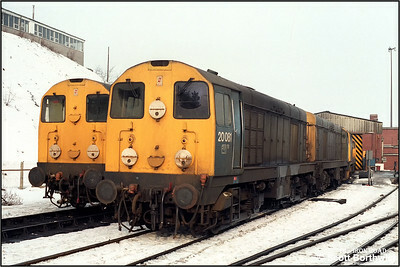 20081+20073, 20148+20132 with 20040 behind, rest between duties at Buxton TMD (BX) on 11/02/1986. 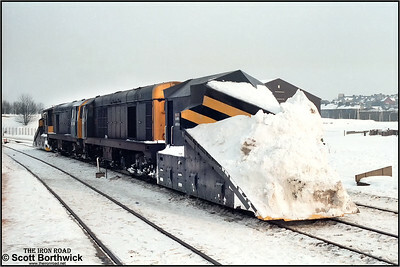 20169+20183 provide the motive power for the Buxton snowplough on 11/02/1986. 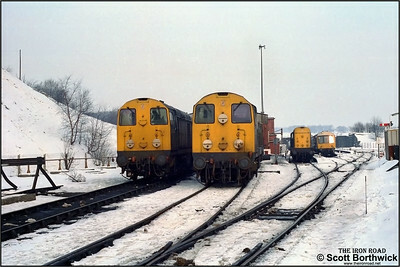 (From left tor right) 20040, 20081 & 20113 await their next duties at Buxton TMD on 11/02/1986. 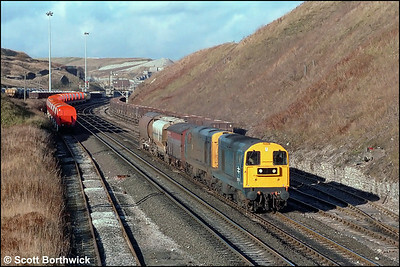 20145+20068 set off from Peak Forest South SS with a trip working to Briggs Sdgs, Hindlow on 20/11/1986. 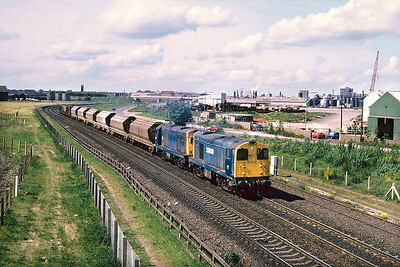 20008+20144 power 6P66 Middlesbrough Goods-Boulby Potash Mine at Southbank, Middlesbrough on 01/06/1988. 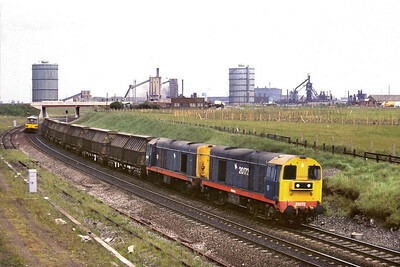 20172+20028 pass Southbank, Middlesbrough in charge of 6P67 Boulby Potash Mine-Middlesbrough Goods on 01/06/1988. 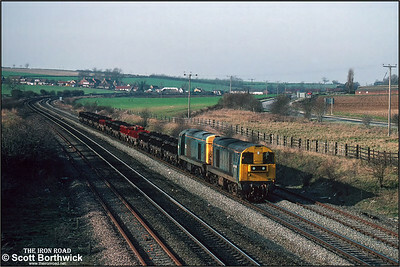 20185+20092 pass Melton Ross with a rake of empty BVW steel coil carriers destined for Grimsby Docks for loading on 06/03/1992. 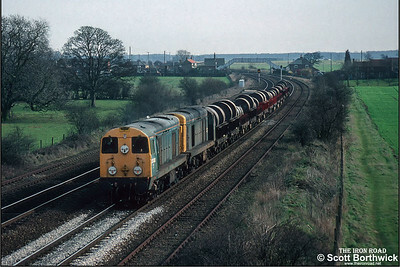 20092+20185 pass Melton Ross whilst working 6T48 from Grimsby conveying steel coil on BVW's on 06/03/1992.